In the years 2012-2013, my art has entered a new phase where I began to form my own creative style, and my artistic behavior began to become more targeted. My works were greatly affected by POP art and contemporary illustration, which is why the popular style seen in my works is closely related to public appreciation of aesthetics. Why did you decide to study in London? London was the first foreign city I got to know about. I did not deliberately choose London, but this city definitely gave me the creative impulse I needed.. As an oriental living in London, the symbol of Western civilization, using Western methods and technique to creative art works of oriental themes, that’s what exactly excites me. Does the work have to be seen altogether to make sense? My works are in series, but each piece is a separate topic. 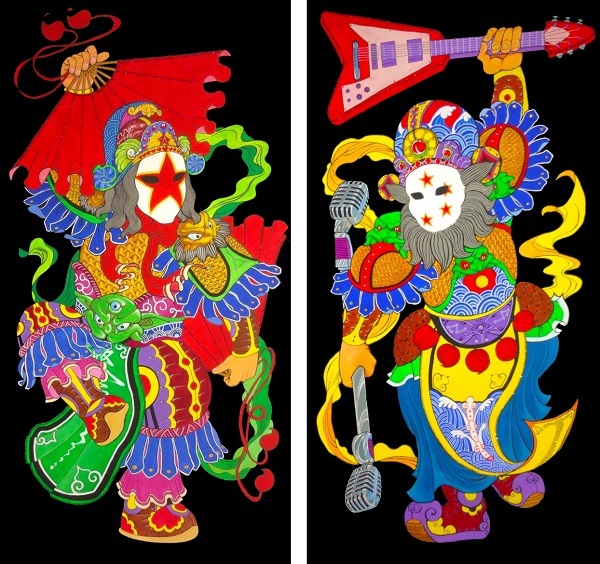 Could you talk about what’s happening in ‘Jade Emperor’ (shown at the beginning) and ‘Dragon King’ (shown above)? First, let me talk about ‘Jade Emperor’, in Chinese mythology, the jade emperor is the ultimate symbol of power in politics. Right now, ‘anti-corruption’ is a major event in China，you can often see in Western media news about Chinese government punishing corrupted officials. This is a good thing, but I am more concerned about the two characteristics Chinese people most often think about when it comes to corrupt officials. The first characteristic is that a lot of corrupt officials stay in China alone, but transfer their families and assets abroad. They are called ‘naked officials’. Another characteristic is that many corrupt officials were found because they have numerous mistresses. Therefore in this piece of work, I drew a large number of women around the naked Jade Emperor. I created the ‘Dragon King’ in a short period of time, because it was a sudden event occurred in China. There were many dead pigs floating on the Huangpu River, unclear of whether it is a human-caused event or due to accidents in the environment. I am concerned about the impact of this event on the environment at the time of creation of the ‘Dragon King’. This event is an elements and the starting point of my creation, because the pollution will definitely have an impact on people. Chinese people consider they are descendants of the dragon, and in Chinese mythology the dragon is the god of waters. 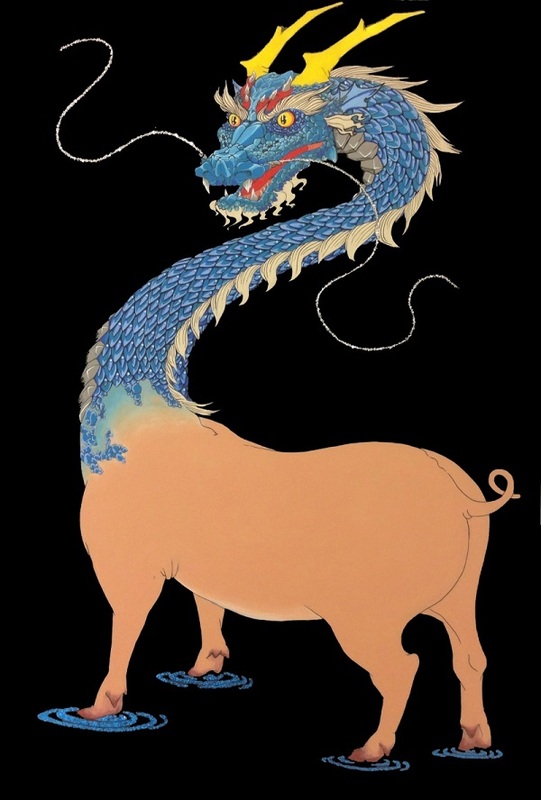 So I created a half-dragon half pig god to record this event, which also gives people the space for association. Why did you choose to paint the backgrounds completely black? In my work there is an extensive use of high-purity color, thus black background is a good contrast. There is no special meaning in choosing black as a background color. I do not like to use aesthetic to reflect the theme, content of the work is enough in reflecting the theme. What’s the thinking behind the gas masks? 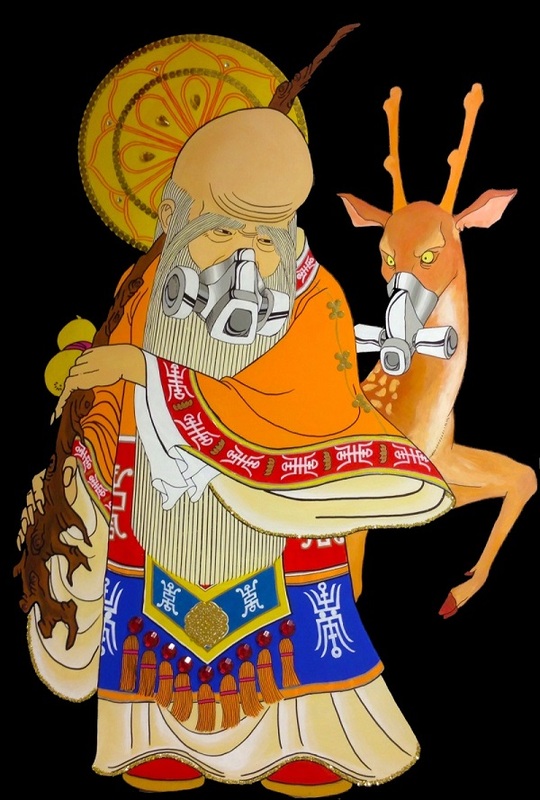 This work is reflected in the presence of air pollution all creatures are equal, including gods and animals. 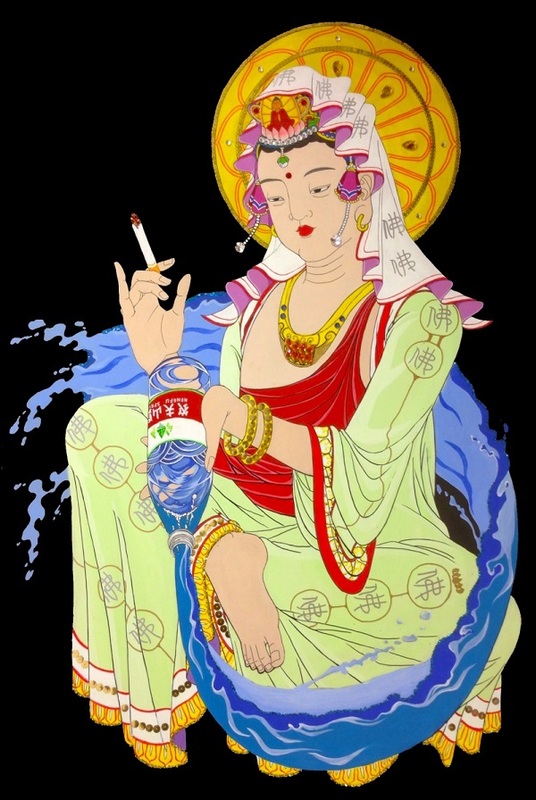 Of course, if you know Chinese mythology, the works reflecting equality also includes rights, wealth and status. What does the ‘China Moment’ mean? Inspiration for my work comes from a number of news reports in China this year, my works concern around the social phenomenon that were happening at this moment. My works emphasize the use of art as a recording tool, thus the creation of ‘China Moment’. What difference have you seen when Westerners or easterners view the work? Do you prefer a certain reaction?